From left: Alan Kraus, CRWP; Mark Purfeerst, Compeer; Shawn Lewis, Compeer; John Becker, Rice Creek farmer; Tim Little, Rice Creek farmer; Kristi Pursell, CRWP; Kevin Strauss, CRWP. 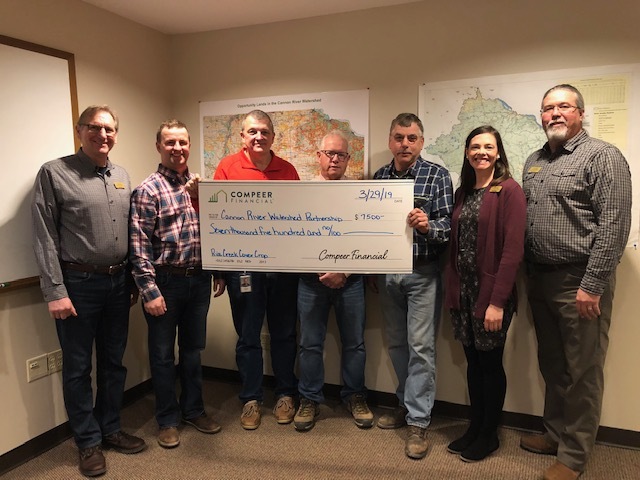 To help area farmers with this daunting challenge, Compeer Financial recently joined other partners in providing financial support to the Cannon River Watershed Partnership (CRWP) to protect the only trout stream in Rice County. Beginning in 2018, nine farmers planted cover crops on 855 acres of land in the Rice Creek watershed which lies just west of Dundas, MN. Cover crops are plants like winter rye, turnip, clovers or oats that are planted sometime during or after the growing season of soybeans and corn to keep the soil covered between fall harvest and spring planting. These crops capture excess fertilizers and can reduce erosion, increase water infiltration into the soil and improve the biology of farm soils. This research project will measure how planting cover crops can improve soil health and corn and soybean production while at the same time reduce fertilizer and sediment runoff into Rice Creek. Other partners in this project include Fishers and Farmers Partnership, Rice County Soil and Water Conservation District (SWCD), St. Olaf College, Minnesota DNR, Minnesota Pollution Control Agency and farmers and landowners in the Rice Creek Watershed. The Compeer Financial Fund for Rural America, the corporate giving program of Compeer Financial, has awarded 49 grants for the organization’s General Use Grant Program, totaling $268,101 this year. General Use Grants fund initiatives and organizations whose work enriches agriculture and rural America, which is Compeer Financial’s mission.